Tech at Night: Netflix does the right thing. Tech at Night: FCC overreach begins to get noticed. 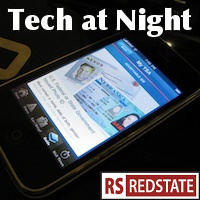 Tech at Night: Republicans pass phone unlocking over Democrat opposition. Manchin calls for Bitoin ban. It’s very interesting how effective Edward Snowden’s pro-Russian propaganda has been in some countries. In some countries WhatsApp is being fled in favor of a Russian app. I guess the world is more worried about NSA than “gay rights” or political prisoners, eh? That’s an effective scam, right there. Netflix uses a lot of bandwidth, and if they start broadcasting 4k movies, then that amount is going to go up. It’s a lot of one-way bandwidth, too. There’s no interchange of data going to and from users. It’s all being piped out. So the traditional concept of ‘peering’ where two Internet companies connect for free to send data both ways, really doesn’t make sense. Thus, Netflix is owning up and making deals to cover that bandwidth. More deals are likely coming. This is good news, as it means realistic investments in Internet infrastructure to make sure we all have enough room for the data we download. The fact that the Net Neuties are shrieking hysterically about this just proves what I was saying all along: Net Neutrality was all about trying to socialize the Internet. Democrats will use any pretext to grow government. Mergers are their a outlet, using them reflexively to insert themselves in and grab power. That’s why they keep having more and more regulators get involved with mergers, on top of DoJ and Congressional meddling. It’s corrosive of the rule of law to have so many capricious decision makers intruding on a whim. But expect to hear a lot of Time Warner Cable/Comcast scary talk coming. Cybersecurity attacks are the new pretext. Instead of treating computer attacks as the crimes they are, and investigating to find and imprison the offenders, Democrats want to blame the victims because it gives them an excuse to increase power over the private sector. That said, I find facial recognition a legitimately difficult issue. On one hand, the kind of tracking that’s becoming possible is amazing. On the other hand, we can’t really put that genie back in the bottle with laws. It’s like gun control: it only stops the honest people. The best argument for the kind of Communications Act reform Greg Walden has been talking about, is that we really need to defang the Net Neutrality obsessed FCC for good.